48 | TH E M R EP O RT O R I G I NAT I O N S E R V I C I N G DATA G O V E R N M E N T S E C O N DA R Y M A R K E T DATA THE LATEST Housing Market Unprepared for Surge in Older Americans The inventory of housing that meets the physical and economic needs of aging adults is not enough to accommodate the mounting population of adults over the age 65. B y the year 2035, more than one in five people in the United States will be at least 65 years old as the over-65 population increases from 48 million to 79 million, according to "Projections and Im - plications for Housing a Growing Population: Older Adults 2015- 2035," by the Harvard Joint Center for Housing Studies (HJCHS). Further, the report showed that one in three households will be headed by someone in that age group, which will increase the demand for affordable, accessible housing that is well-connected to services beyond what current supply can meet. HJCHS added that this growth will increase the demand for properties with design elements such as zero-step entrances, single- floor living, and wide halls and doorways. Currently, only 3.5 percent of homes offer all these features, the report noted. "The housing implications of this surge in the older adult popula - tion are many," said Chris Herbert, Managing Director of HJCHS, "and call for innovative approaches to respond to the growing need for housing that is affordable, accessible and linked to supportive services that will grow exponentially over the next two decades." Data from the report indicated that in coming years, many older adults will have the financial means to pay for appropriate housing, but many others will be faced with financial hardships due to declining incomes in retirement. In total, the report estimates, by 2035 8.6 million people will be spending more than half their income on housing. "Right now, more than 19 mil - lion older adults live in unafford- able or inadequate housing, and that problem will only grow worse in the next two decades as our population ages," said Lisa Marsh Ryerson, President of AARP Foundation, which provided fund - ing for the report. 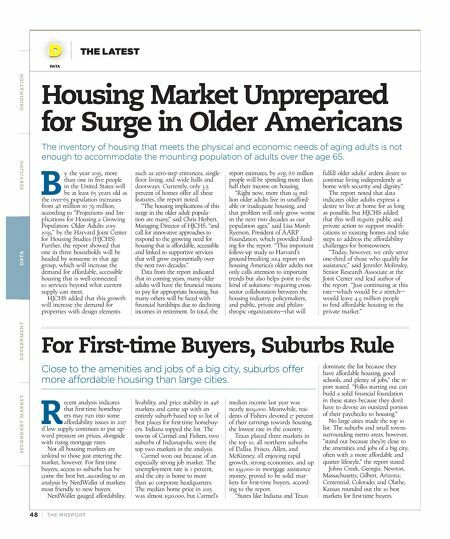 "This important follow-up study to Harvard's ground-breaking 2014 report on housing America's older adults not only calls attention to important trends but also helps point to the kind of solutions—requiring cross- sector collaboration between the housing industry, policymakers, and public, private and philan - thropic organizations—that will fulfill older adults' ardent desire to continue living independently at home with security and dignity." The report noted that data indicates older adults express a desire to live at home for as long as possible, but HJCHS added that this will require public and private action to support modifi - cations to existing homes and take steps to address the affordability challenges for homeowners. "Today, however, we only serve one-third of those who qualify for assistance," said Jennifer Molinsky, Senior Research Associate at the Joint Center and lead author of the report. "Just continuing at this rate—which would be a stretch— would leave 4.9 million people to find affordable housing in the private market." For First-time Buyers, Suburbs Rule Close to the amenities and jobs of a big city, suburbs offer more affordable housing than large cities. R ecent analysis indicates that first-time homebuy- ers may run into some affordability issues in 2017 if low supply continues to put up- ward pressure on prices, alongside with rising mortgage rates. 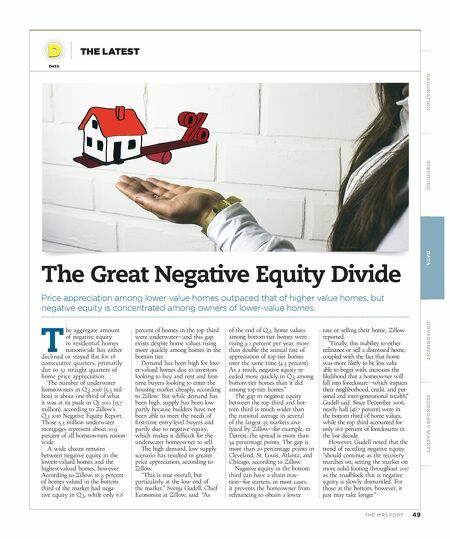 Not all housing markets are unkind to those just entering the market, however. For first-time buyers, access to suburbs has be - come the best bet, according to an analysis by NerdWallet of markets most friendly to new buyers. NerdWallet gauged affordability, livability, and price stability in 448 markets and came up with an entirely suburb-based top 10 list of best places for first-time homebuy- ers. Indiana topped the list. The towns of Carmel and Fishers, two suburbs of Indianapolis, were the top two markets in the analysis. Carmel won out because of an especially strong job market. The unemployment rate is 2 percent, and the city is home to more than 40 corporate headquarters. The median home price in 2015 was almost $320,000, but Carmel's median income last year was nearly $109,000. Meanwhile, resi - dents of Fishers devoted 17 percent of their earnings towards housing, the lowest rate in the country. Texas placed three markets in the top 10, all northern suburbs of Dallas. Frisco, Allen, and McKinney, all enjoying rapid growth, strong economies, and up to $39,000 in mortgage assistance money, proved to be solid mar - kets for first-time buyers, accord- ing to the report. "States like Indiana and Texas dominate the list because they have affordable housing, good schools, and plenty of jobs," the re- port stated. "Folks starting out can build a solid financial foundation in these states because they don't have to devote an outsized portion of their paychecks to housing." No large cities made the top 10 list. The suburbs and small towns surrounding metro areas, however, "stand out because they're close to the amenities and jobs of a big city, often with a more affordable and quieter lifestyle," the report stated. Johns Creek, Georgia; Newton, Massachusetts; Gilbert, Arizona; Centennial, Colorado; and Olathe, Kansas rounded out the 10 best markets for first-time buyers.